In June, Cleveland will host the Donate Life Transplant Games of America, a biennial multi-sport festival featuring 3,000 athletes competing in 20 events. It provides the perfect backdrop to discuss organ, eye, and tissue donation. More than 123,000 Americans are waiting for a life-saving organ transplant with more than 3,300 waiting at one of Ohio's 10 transplant centers. While 56 percent of Ohio driver's license holders are registered organ and tissue donors, it's still not enough to meet the demand. Every 48 hours an Ohioan dies waiting for an organ transplant. Cleveland was chosen to host the Transplant Games of America partially due to the strength of our healthcare systems and local transplant programs. Join us for a conversation with local leaders on the about the state of transplantation and what you can do to help. 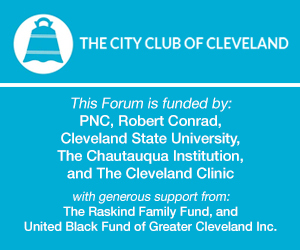 This conversation is moderated by City Club CEO and living liver donor Dan Moulthrop.